My reserved room was given to another person with the same last name. It too 30 - 45 minutes to get everything straightend out and I was late to a wedding rehersal due to this. Other than the check-in incident, the hotel was a great place to stay. Highly recommend. Clean and neat. Great views of the water. Free parking. Nice and friendly staff. Staff was wonderful, extremely helpful. Loved the view of the bay from our room. Watching the boats in the evening was very relaxing. Close to restaurants and other attractions. Very helpful and friendly staff. Very relaxing. The bathroom sink could have been a little more cleaner. Under the rim was black in one spot. 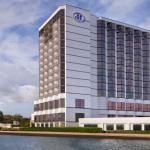 The pet-friendly Hilton Houston NASA Clear Lake is located on the North Shore of Clear Lake and comprises 243 rooms designed for the upmarket business and pleasure traveler. Items included with the room rate are high-speed Internet access, local telephone calls, in-room coffee and parking. There is meeting and banquet space available for business or social functions that can accommodate 500 guests. The property is across the street from the NASA Johnson Space Center. Other area landmarks and attractions include the Big League Dreams Ballpark, the Kemah Boardwalk, the Kemah Lighthouse District, Old Town Seabrook, Moody Gardens, the Schliterbahn water park on Galveston Island, Armand Bayou Nature Center, Sylvan Beach Park and downtown Houston. The rooms come with a choice of one king size bed or two double beds. The amenities include a work desk with ergonomic chair and high-speed Internet access, television with cable movie and news channels, two dual-line telephones with voicemail, speakerphone and data ports, coffeemaker, iron and ironing board, easy-to-set alarm clock-radio and a hairdryer. Many room have lake views. Handicap accessible rooms are available. This hotel has an outdoor swimming pool and a fitness center. The 24-hour front desk has safe deposit boxes and information on area events and attractions. Other amenities include a business center, laundry and dry cleaning services, a cocktail lounge, ATM and ice and vending machines. The on-site Luna Restaurant is open for lunch and dinner and room service is available from 6.30am until 10pm. This is a great hotel with great views of Clear Lake, home to one of the largest boating communities in the United States. Those who have stayed here were impressed with the spacious and well equipped rooms and the renovated lobby. There were good comments about the professional and friendly team of employees and most visitors said they could certainly stay at this Hilton again and recommend the property to others.